I just shot this one for myself. This was a "quickie" and there are flaws of course. It's my Eroica bike for this year. Cost for paint/incidentals pushing $100. Painters are notoriously flaky, so I just shoot my own now. This was my first time doing a candy, and it's as difficult as they say. Very hard to get a consistent hue, especially on a bike frame. I paint a lot of things, and bike frames are the most difficult without any doubt. All the tubes and crevices present a real challenge unless you have some degree of skill. 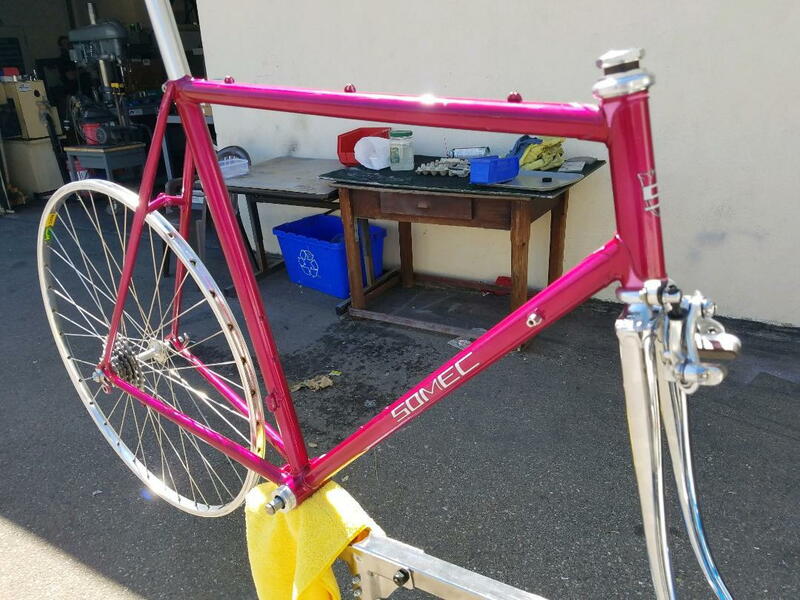 If you've had a frame and fork resprayed, would you be willing to say how much it cost? Please feel free to add any additional information that might be useful - scope and complexity of the job, tips to remember, and so on. I think it would be useful to have a thread that gives a sense of how much a respray costs, both to help in buy/sell decisions and to help when actually shopping around for a frame painter. I got my frame for a new build powdercoated a few years ago - it was a Soma frame. Not sure if it got striped first as it was a new frame. It ended up being about $200 plus a few bucks for the head badge. The powder coater was in San Leandro, CA. Are you quoting in Loonies? Yes, but my original post was from 2012, prices have gone up I am sure. I did have Mayfair plating do another Colnago Presicia (sp?) fork for me this past summer and it was $60, I think I posted a photo of the final product somewhere on this site. I doubt Marinoni will still paint one of their frames for $200 but I doubt that it is much more than that. Last edited by SamSpade1941; 03-19-19 at 08:04 PM. Jackie and Joules - My '74 Paramount Touring Gets Campagnolo Electronic Shifting!